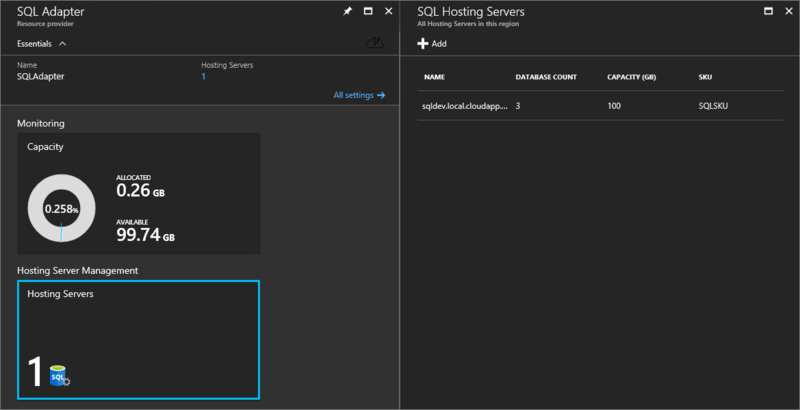 You can create SQL Server database hosting servers on a virtual machine (VM) in Azure Stack, or on a VM outside your Azure Stack environment, as long as the SQL resource provider can connect to the instance. The SQL resource provider should be created in the default provider subscription while SQL hosting servers should be created in a billable, user subscription. The resource provider server should not be used to host user databases. Before you add a SQL hosting server, review the following mandatory and general requirements. Enable SQL authentication on the SQL Server instance. Because the SQL resource provider VM isn't domain joined, it can only connect to a hosting server using SQL authentication. Configure the IP addresses for the SQL instances as Public when installed on Azure Stack. The resource provider, and users, such as Web Apps, communicate over the user network, so connectivity to the SQL instance on this network is required. Dedicate the SQL instance for use by the resource provider and user workloads. You can't use a SQL instance that's being used by any other consumer. This restriction also applies to App Services. Configure an account with the appropriate privilege levels for the resource provider (described below). You are responsible for managing the SQL instances and their hosts. For example, the resource provider doesn't apply updates, handle backups, or handle credential rotation. SQL IaaS virtual machine images are available through the Marketplace Management feature. These images are the same as the SQL VMs that are available in Azure. Make sure you always download the latest version of the SQL IaaS Extension before you deploy a SQL VM using a Marketplace item. The IaaS extension and corresponding portal enhancements provide additional features such as automatic patching and backup. For more information about this extension, see Automate management tasks on Azure Virtual Machines with the SQL Server Agent Extension. The SQL IaaS Extension is required for all SQL on Windows images in the marketplace; the VM will fail to deploy if you did not download the extension. It is not used with Linux-based SQL virtual machine images. There are other options for deploying SQL VMs, including templates in the Azure Stack Quickstart Gallery. 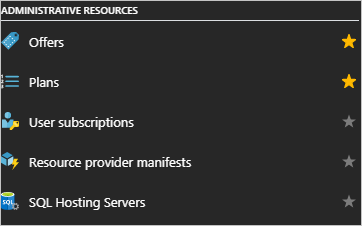 Any hosting servers installed on a multi-node Azure Stack must be created from a user subscription and not the Default Provider Subscription. They must be created from the user portal or from a PowerShell session with an appropriate login. All hosting servers are billable VMs and must have appropriate SQL licenses. The service administrator can be the owner of that subscription. All Azure Stack storage is encrypted using BitLocker, so any SQL instance on Azure Stack will use encrypted blob storage. The SQL Resource Provider fully supports TLS 1.2. Ensure that any SQL Server that is managed through the SQL RP is configured for TLS 1.2 only and the RP will default to that. All supported versions of SQL Server support TLS 1.2, see TLS 1.2 support for Microsoft SQL Server. Use SQL Server Configuration Manager to set the ForceEncryption option to ensure all communications to the SQL server are always encrypted. See To configure the server to force encrypted connections. Ensure any client application is also communicating over an encrypted connection. The RP is configured to trust the certificates used by the SQL Server instances. You can use standalone (non-HA) SQL servers using any edition of SQL Server 2014 or SQL Server 2016. Make sure you have the credentials for an account with sysadmin privileges. Sign in to the Azure Stack operator portal as a service administrator. Select All services > ADMINISTRATIVE RESOURCES > SQL Hosting Servers. Under SQL Hosting Servers, you can connect the SQL resource provider to instances of SQL Server that will serve as the resource provider’s backend. Click Add and then provide the connection details for your SQL Server instance on the Add a SQL Hosting Server blade. Optionally, provide an instance name, and specify a port number if the instance isn't assigned to the default port of 1433. As long as the SQL instance can be accessed by the user and admin Azure Resource Manager, it can be placed under control of the resource provider. The SQL instance must be allocated exclusively to the resource provider. As you add servers, you must assign them to an existing SKU or create a new SKU. Under Add a Hosting Server, select SKUs. To use an existing SKU, choose an available SKU and then select Create. To create a SKU, select + Create new SKU. In Create SKU, enter the required information, and then select OK. The SQL adapter resource provider only supports SQL 2016 SP1 Enterprise or later instances for Always On Availability Groups. This adapter configuration requires new SQL features such as automatic seeding. You must enable Automatic Seeding on each availability group for each instance of SQL Server. The availability group must be enclosed in square brackets. Before adding a contained database to an availability group, ensure that the contained database authentication server option is set to 1 on every server instance that hosts an availability replica for the availability group. For more information, see contained database authentication Server Configuration Option. Sign in to the Azure Stack Administration portal as a service admin. Select Browse > ADMINISTRATIVE RESOURCES > SQL Hosting Servers > +Add. Under SQL Hosting Servers, you can connect the SQL Server Resource Provider to actual instances of SQL Server that serve as the resource provider’s backend. Fill out the form with the connection details for your SQL Server instance. Make sure that you use the FQDN address of the Always On Listener (and optional port number and instance name). Provide the information for the account you configured with sysadmin privileges. Check the Always On Availability Group box to enable support for SQL Always On Availability Group instances. Add the SQL Always On instance to a SKU. You can't mix standalone servers with Always On instances in the same SKU. Attempting to mix types after adding the first hosting server results in an error. As a best practice, all the hosting servers in a SKU should have the same resource and performance characteristics. SKUs can't be assigned to specific users or groups. SKUs can take up to an hour to be visible in the portal. Users can't create a database until the SKU is fully created. To edit a SKU, go to All services > SQL Adapter > SKUs. Select the SKU to modify, make any necessary changes, and click Save to save changes. To delete a SKU that is no longer needed, go to All services > SQL Adapter > SKUs. Right-click the SKU name and select Delete to delete it. It can take up to an hour for new SKUs to be available in the user portal. Create plans and offers to make SQL databases available for users. Add the Microsoft.SqlAdapter service to the plan and create a new quota. It can take up to two hours for new quotas to be available in the user portal or before a changed quota is enforced.